Dannika Dark (Official website): Seven Series SALE! The first THREE books in the Seven Series are on sale! For just $0.99, you can experience the humor, action, romance, and thrill of the Seven Series. With characters so real, you'll never forget them. 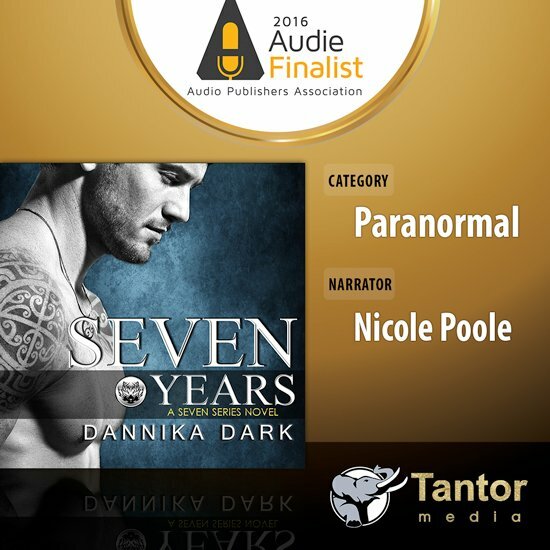 "I am not into paranormal romance, but I took a chance with the first book, Seven Years, and quickly devoured the rest of the series. I was looking for a light read but what I got were tales of adventure, family, love, and characters with their own complex personalities that resonated with me in a way I can't explain. Finishing up these books was like saying goodbye to old friends. I have never enjoyed a series as much as the Seven Series." "All of the characters are love worthy, you just can't help being in love with the whole 'pack'!!! Can't wait for more of this series!!!!!" " I have finally found out what book boyfriend means! " "I'm in love with this series, and these wolves!!" "I love the intricacies of her writing , the foreshadowing of future events. It has me questioning everything I read and wondering what will happen next. Sleep has become non-existent and I cannot wait to keep going. Brilliant!!!" I would definitely recommend the Seven Series to anybody on the fence about entering the PN genre. Dannika's writing is brilliant and you can easily get lost in the shifter world without feeling overwhelmed.